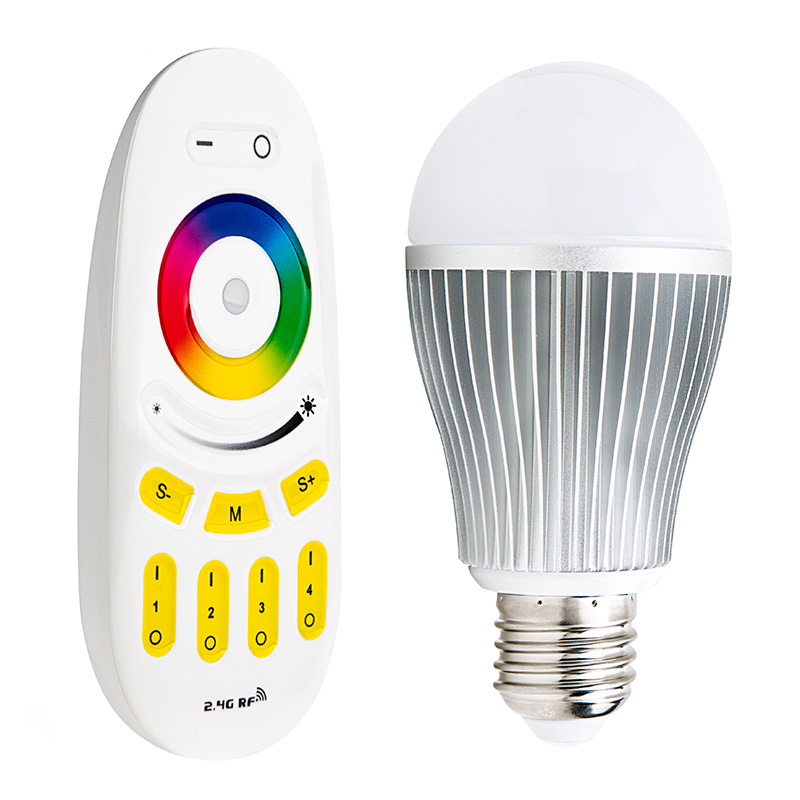 Designed to replace globe type LED bulbs, this RGBW LED bulb includes an RF Touch Color Remote with a control range of up to 65' in open air and a color wheel that provides a variety of color options. 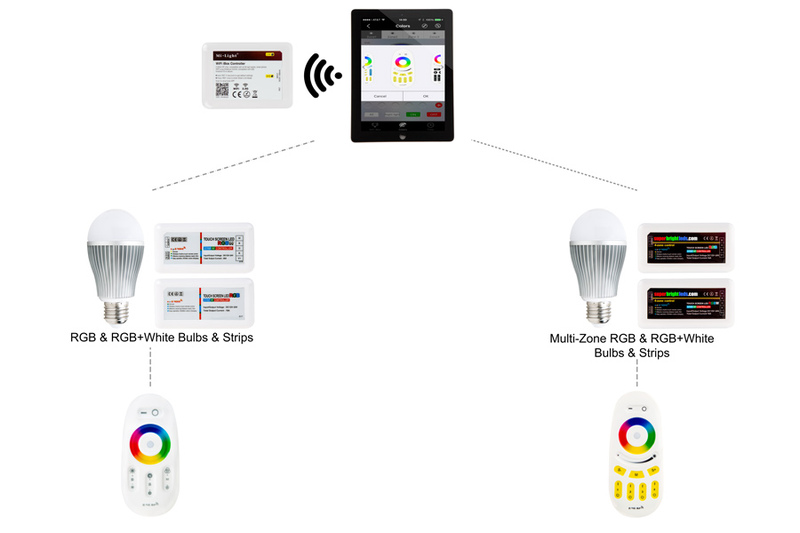 The multi-zone remote function allows you to control up to 4 separate zones of RGBW LED smart bulbs that can be linked. 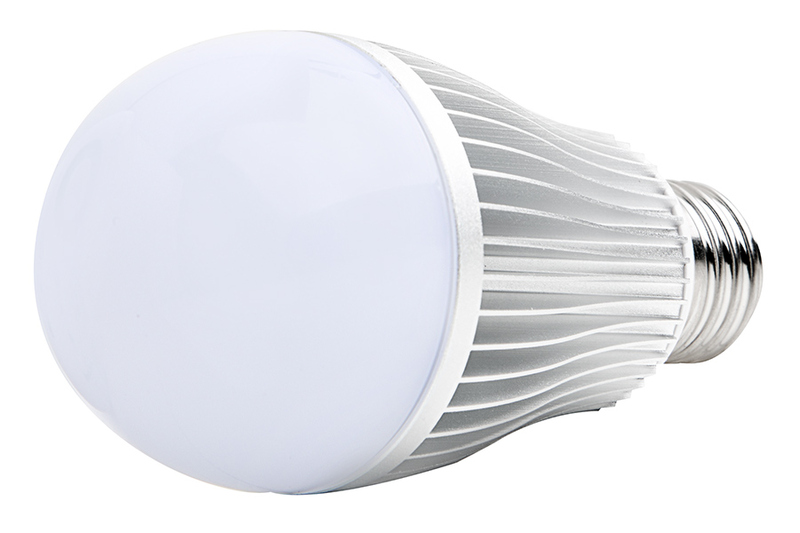 The bulb can also be controlled using your Android or iOS enabled smartphone or tablet with the compatible Wi-Fi LED Controller Hub and free MiLight 3.0 app. 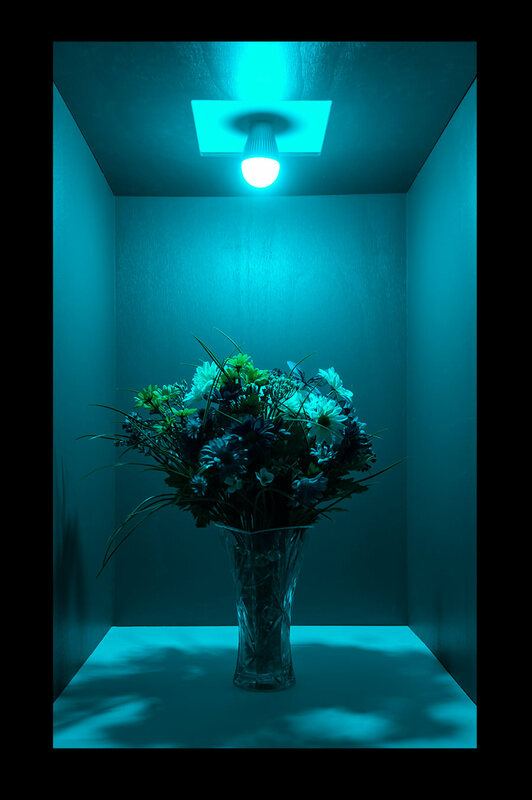 Each bulb fits traditional E26/E27 medium screw base lamps and uses 4 RGB and/or 15 white LEDs (5050 SMD) to emit up to 850 lumens. 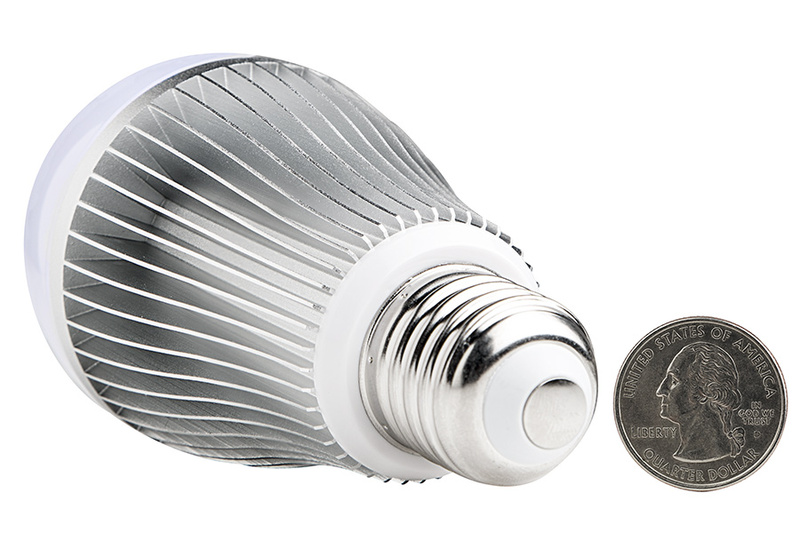 The bulb consumes just 13.2 watts of power; an incandescent bulb with comparable output would consume 60 watts. Available in RGB+cool white and RGB+warm white. Acts as a master On(-)/Off(O) control for all zone-linked RGBW lights. Also activates the “Master” function, which allows the remote to control the RGBW lights of all zones. If a zone is currently active, pressing the master On(-) button restores the “Master” function to the remote. Allows up to four “zones” (i.e. channels) of RGB(W) lights to be separately linked and controlled by the remote. Pressing one of the Zone On(|) buttons activates that zone; commands will affect only lights in that zone. Once linked to a zone, lights remain linked until they are unlinked. Steadily depressing the Zone On(|) button restores the lights in that zone to white. 1 Six Color Fade In/Out Red, Yellow, Green, Cyan, Blue and Purple fade in and out in a continuous repeating cycle. 2 White Fade In/Out White fades in and out continuously. 3 RGBW Fade In/Out Red, Green, Blue and White fade in and out in a continuous repeating cycle. 4 Seven Color Flash Red, Green, Blue, Yellow, Purple, Cyan and White cycle in set pattern with flashing transitions. 5 Disco Random Pattern Red, Green, Blue, Yellow, Purple, Cyan and White cycle at random with flashing transitions. 6 Red Fade In/Out with 3 Flashes Red increases to full brightness then flashes 3 times. 7 Green Fade In/Out with 3 Flashes Green increases to full brightness then flashes 3 times. 8 Blue Fade In/Out with 3 Flashes Blue increases to full brightness then flashes 3 times. 9 All Pattern Mode All 8 patterns above cycle through and repeat. DO NOT install with power applied to socket. DO NOT uexpose the remote or bulb to direct or indirect moisture. 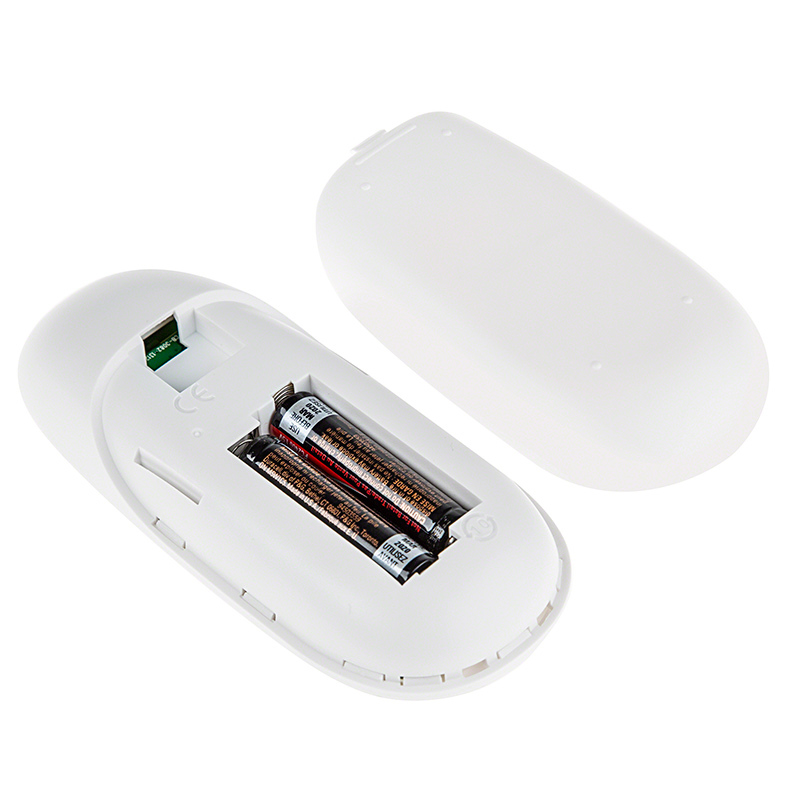 Install 2 AAA batteries (not included) in the wireless remote. Screw the RGBW bulb into a socket and turn power on. If bulb does not illuminate, check socket and power connections. The RGBW bulb is ready for linking to the wireless remote. 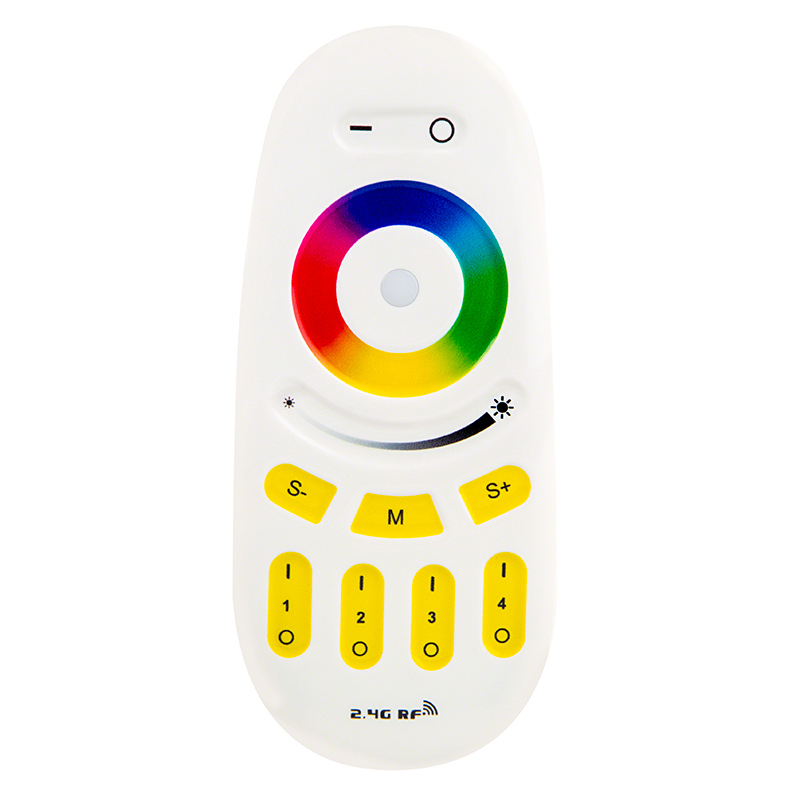 RGB(W) lights are controlled exclusively by the multi-zone RF remote via the controller. Switch off the main power supply to the light. Restore power and within 3 seconds, choosing one of the “Zone On” (|) buttons, depress the button until the light begins flashing. It will flash white 2 times, indicating that the light is now linked to that numbered zone and can be controlled via the remote. Determine which zone the light is linked to. This can be done by testing the Zone On/Off controls for each zone on the remote. Restore power and within 3 seconds, depress one of the “Zone On” (|) buttons until the light flashes 10 times, indicating that the light has been unlinked. 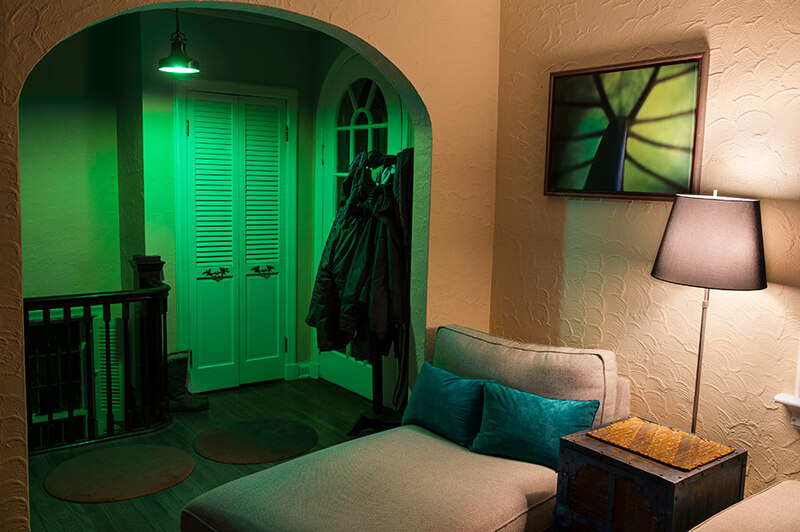 An unlimited number of RGB(W) lights can be linked to a zone, and all lights linked to that zone will respond to the commands entered on the wireless remote. Conversely, a single RGB(W) light can be linked to multiple remotes. When the light is unlinked, it will be unlinked to all remotes. Programming is a little tricky.. 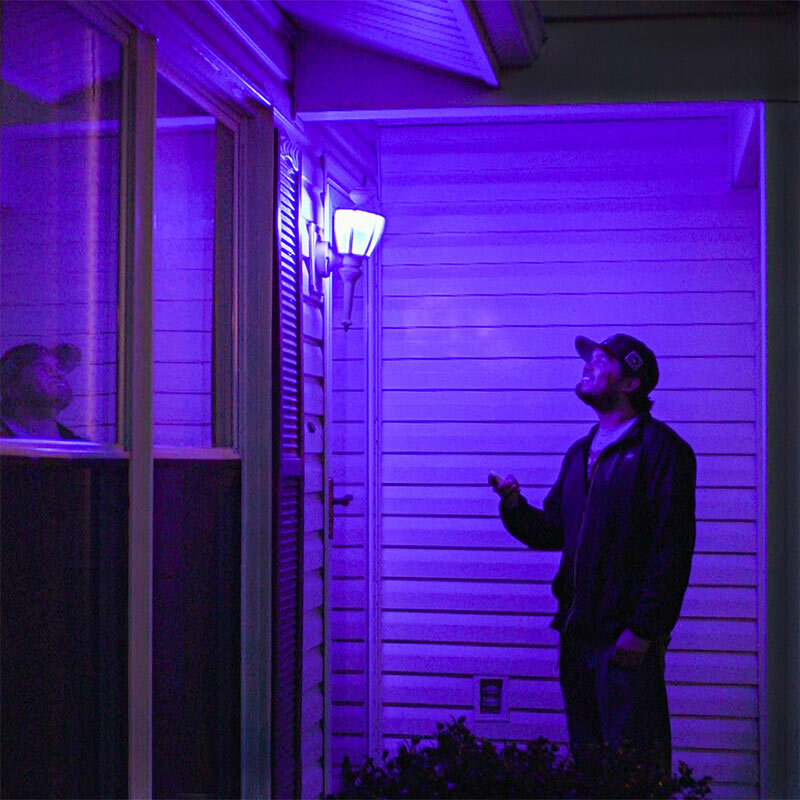 I still give it 5 stars because of the ease of the product overall and the light output is expected.. (when it's not as bright as you may think, the color choices on this product makes up for it). I have both the cool white and warm white bulbs. No one can tell that it's a color changing bulb. The cool white is 850 lumens, so it's not that huge of an improvement over a cool white CFL output.. but the colors is what you want. 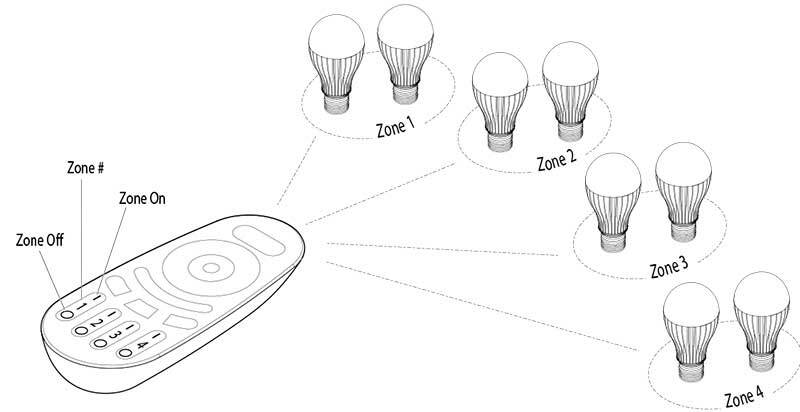 The remote itself is easy to use and you can link up to 4 zones with practically unlimited amount of bulbs to each zone (provided with the distance of your zone isn't more than 65' radius of zero obstructions and if you had the time to sync them all together when programming). 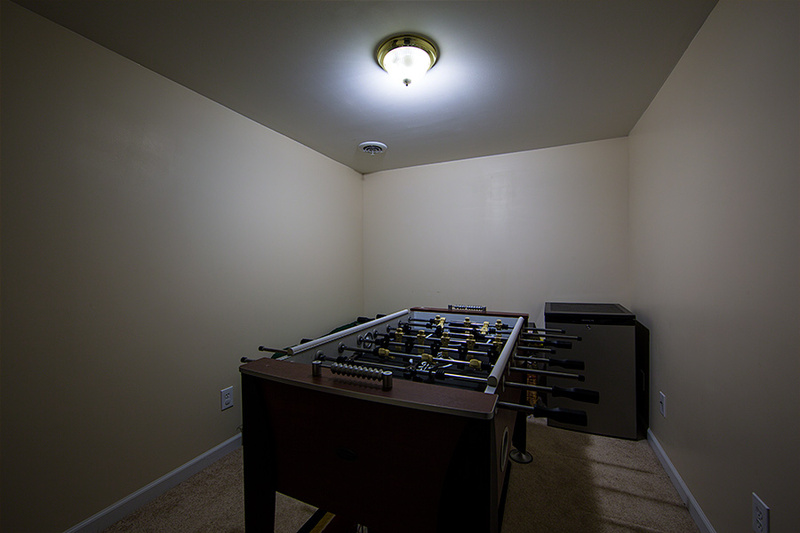 My only issue for the programming was linking and unlinking when the bulbs were using the same power light switch (as I wanted my living room recessed lights to function in 4 zones, but all the lights were controlled by 1 switch). As expected, the white is very bright (and surprisingly pleasant, even as cool white), the colors less so. So this is really a hybrid light: use it to light your living room in white mode (it’s bright enough for that, even with a milky glass shade) — or use a color mode for subdued mood lighting. Even though this is not promised, I thought the many button on the remote could perhaps allow to program custom color programs (think red-white-blue for the Fourth of July or green-red for Christmas). This is not possible with the current remote. Still, within these minor constraints, it’s a fun and useful product, less expensive than others. Recommended! Got this light because of the brightness and RGB with remote. Description says 800-850 lumens max for the cool white, I was expecting the color LED's to be sort of in that high range. When I put it in cold white it will light up my whole porch since I'm using the light as my porch light. When I change it to colors thats when you can see the reduction in brightness. The colors are bright enough to light up the porch, depending on the color. I like all the options i.e. changing colors and having it in white only. 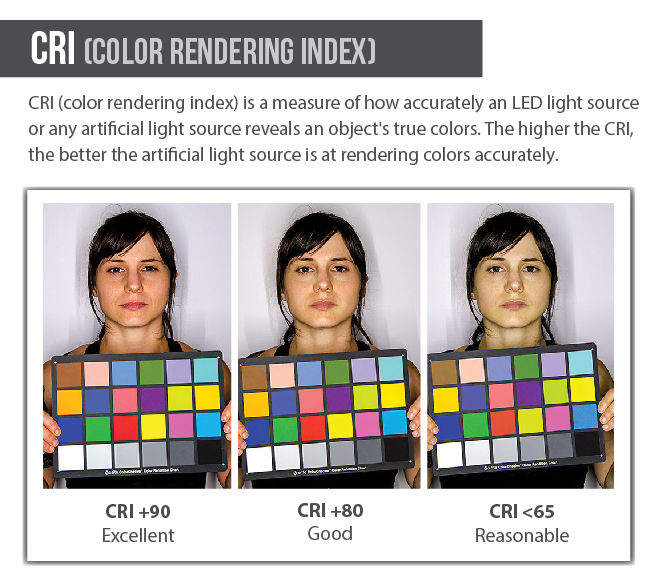 But I would really like the bulb if you guys can increase the color output close to 850 lumens. Since I had a florescent green bulb outside that provided about the same output as what I'm getting now I'm rating three stars. Increase the color output and this will definitely be 5+ stars. Using these bulbs in recessed light fixtures on our front porch. 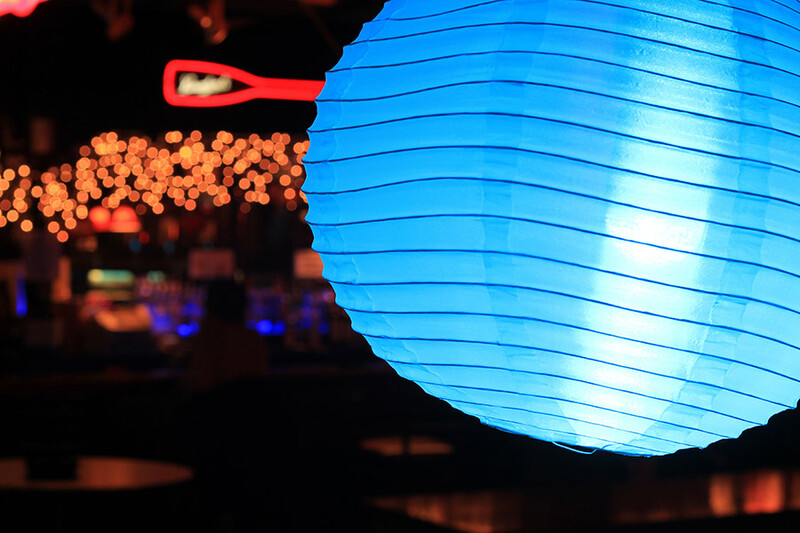 Love the ability to alter and or mix colors for various lighting effects and holidays. 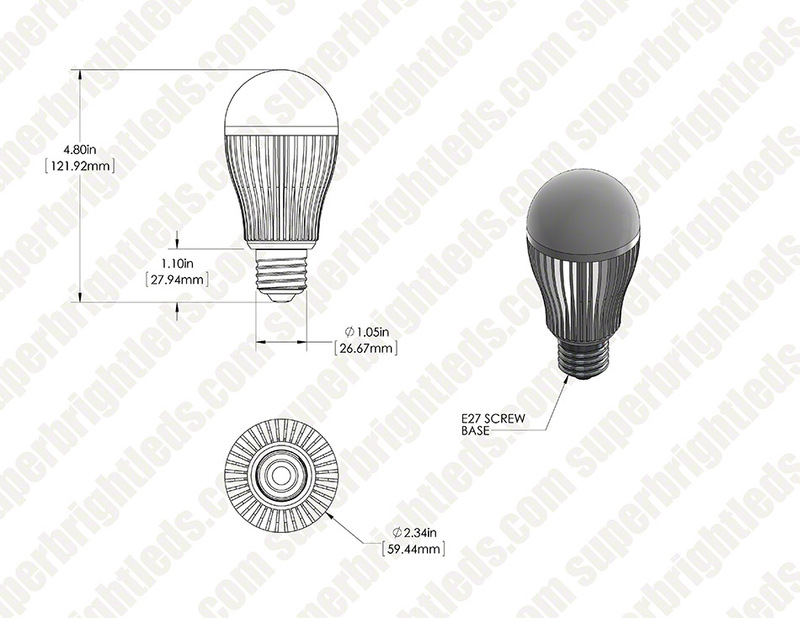 Bulb base is finned aluminum for any heat dispersion. Feels and looks well made.Both the bulb and the controller operate seamlessly. 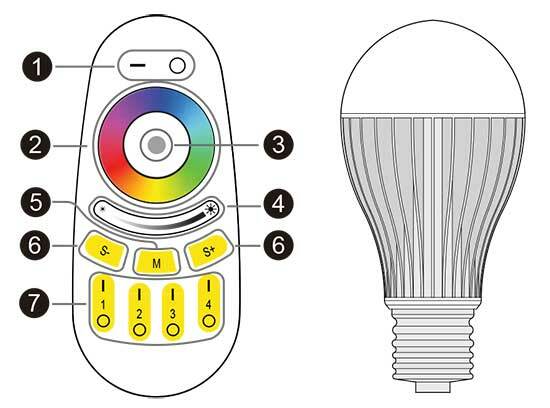 Commands from the remote are instantly received by the bulb and the change is instantly noticed. Flicker while of after dimming to a desired level is virtually non-exsistant. Bulb brightness at both the high and low settings is perfect. The command for white light is simple from any previous setting. About the only thing I didn't care for were some of the preset modes. There are ten included and a few elect to utilize a rapid blink of a particular color. Even when slowed down through the remote they really don't appeal to me. Oh and by the way the speed of any of the modes can be lowered or raised from the remote.